On the left sidebar, about half way down, there is a player called Streampad. It looks like the picture to the right. That player allows you to listen to all the mp3s I post to this blog in a playlist. 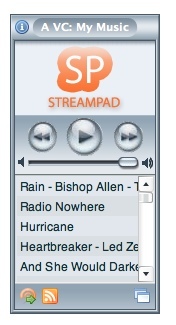 And if you click on the icon on the lower right of the streampad player, it will popup into a new window and you can listen for as long as you like. As I roll out my top 10 over the next couple weeks, the player will fill up with songs from my favorite records of the year.